When I was in high school, I had a friend who was half Syrian and it was at her house that I helped make meat stuffed grape leaves. This was my first introduction to dolmas. I had never had the rice-stuffed ones that are far more popular until years to come. In fact, I rarely see meat-stuffed dolmas anymore. 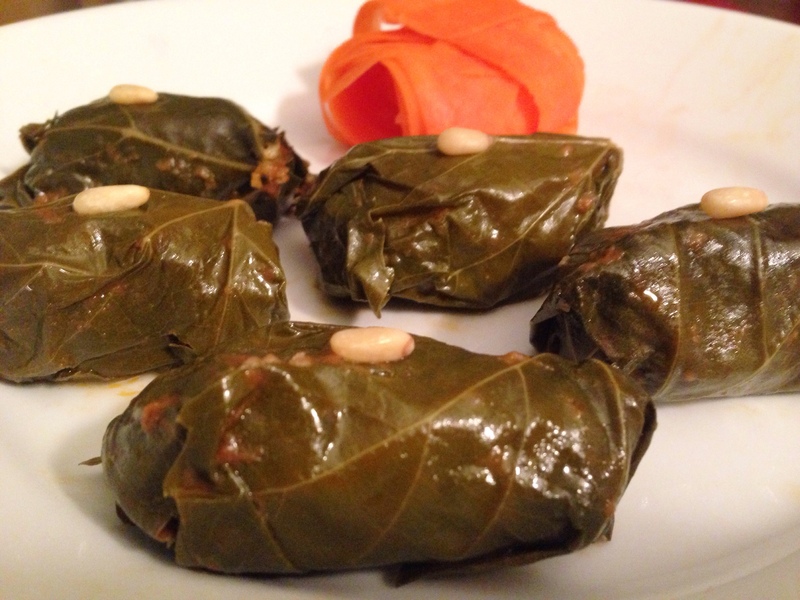 As I look to increate the amount of protein in my diet, these type of dolmas came to mind. I don’t recall what was in the meat-rice stuffing or the exact ingredients in the cooking liquid other than that it contained lemon juice and tomato sauce in (which I remember thinking was a bit odd at the time) and that we lined the pot with unused grape leaves so that the bottom layer would not burn when cooking. But, what I do remember is that I really liked eating them. Stuffed grape leaves or dolmas are popular in Mid-Eastern food, Greek food and Turkish food, made with varying fillings, spices and sauces, depending on the region. Since my first encounter was of Syrian influence, I kept this recipe of that culture, using allspice as a main seasoning ingredient and combining a mixture of beef and lamb, sprinkled with pine nuts along with the rice. The rice is rinsed twice to remove the starch, then added to the meat mixture. I was able to buy jarred brined grape leaves at Whole Foods, but given the wide amount of cultures that make stuffed grape leaves, I would think that most supermarkets would carry them as well. To assemble the grape leaf pockets, unravel the grape leaves from the jar and separate the leaves. Place one leaf on a flat surface, shiny side down. Place a tablespoonful of stuffing in the center of the leaf. Note that for the smaller leaves, the fillings might need to be smaller, perhaps more like a teaspoon in size. To make the packet, fold the top leaf down, pressing into the stuffing, then fold in the left side, then tuck the bottom left leaf into the fold, pushing into the stuffing, and then toll the wrapped stuffing from left to right to cover the right side, tucking in the top and bottom leads in as you roll. Repeat the process until all of the filling is used. You will have plenty of grape leaves left over, so if they are small or ripped, choose another. To cook the grape leaves, I lined the pot with carrots rather than the left over grape leaves to prevent burning the bottom layer of grape leaves. 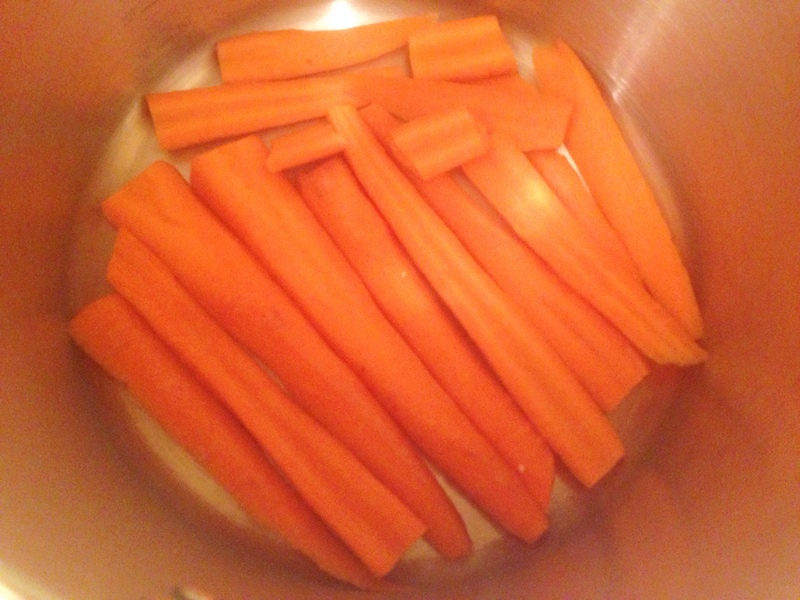 The carrots offer the right amount of protection while also providing a flavoring ingredient for the sauce. To do this, I cut up about 4-5 carrots length-wise about 1/8″-1/4″ in thickness, and fit them to cover the bottom of the pot. Then I layered the grape leaves on top. I have read that you are not supposed to have more than 3 layers of meat stuffed grape leaves to help keep the cooking time even. Once the grape leaves are stacked, I add the ingredients of the sauce. 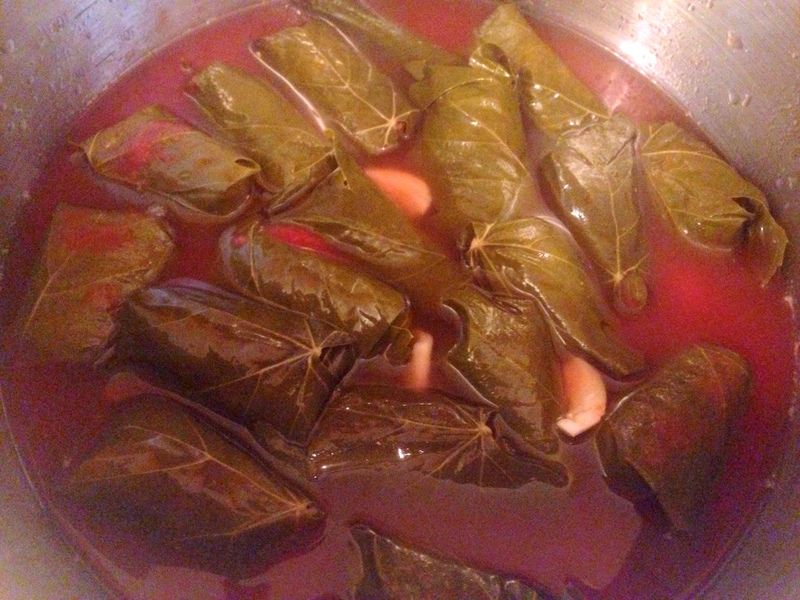 I mix the tomato sauce with 2 cups of water to thin it out and pour it over grape leaves. Then I add lemon juice, garlic, mint leaves, and then more water until the liquid meets the top of the grape leaves. An inverted plate is then placed on top of the grape leaves, and finally the cover to the pot. Cook the grape leaves on a simmer for 50-60 minutes until the rice has cooked through. Discard carrots and strain sauce. Serve the dolmas hot with the sauce. Make filling: Pour the cup of rice into a bowl and add water to cover. Swirl the rice around with a spoon to help release the starch. Drain in a colander and repeat process. Add the beef, lamb, rinsed rice, pine nuts, allspice, cinnamon, salt and pepper in a bowl and mix through. Unwrap the grape leaves and one at a time, lie it flat shiny side down on a flat surface. Place about a tablespoon of filling in the center (less if the leaf is small). To make the packet, fold the top leaf down, pressing into the stuffing, then fold in the left side, then tuck the bottom left leaf into the fold, pushing into the stuffing, and then toll the wrapped stuffing from left to right to cover the right side, tucking in the top and bottom leads in as you roll. Repeat the process until all of the filling is used.
. Discard carrots and strain sauce. Serve the dolmas hot with the sauce. 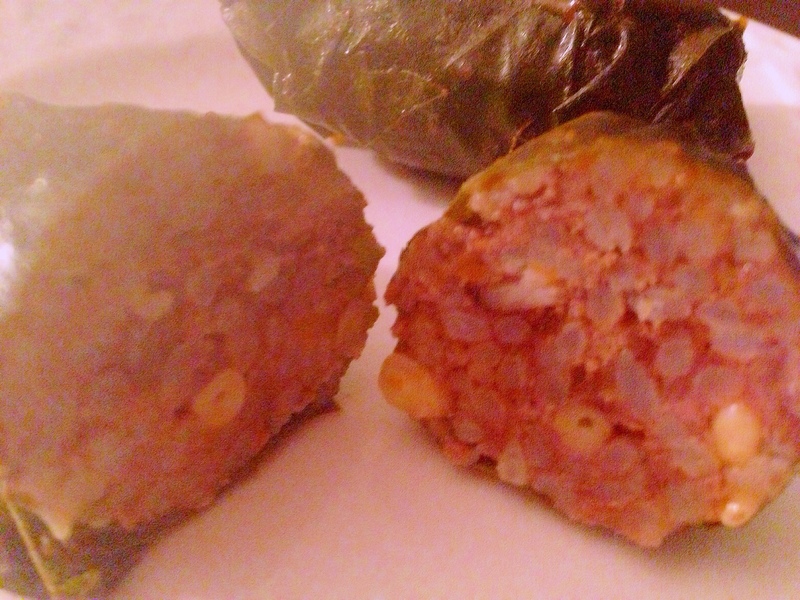 This entry was posted in Blog, Recipes and tagged dolmas, gluten free, grape leaves, lamb, meat stuffed dolmas, meat stuffed grape leaves, pine nutes on March 2, 2014 by Leslie.